The top players in the North American agriculture robots market include: Clearpath Robotics, Harvest Automations, Inc., and PrecisionHawk, Inc. SenseFly SA and Naio Technologies were the leading companies in the European agriculture robots market and Shibuya Seiki from Asia Pacific. The market is thus, basically characterized by numerous players which hold prominence in their respective regions, Transparency Market Research (TMR) states in its new study. The number of emerging players from each region is also growing and this denotes the absence of barriers in entering the agriculture robots market. Moreover, increasing number of players also suggest increased competition, thereby leading to intense competition among players. 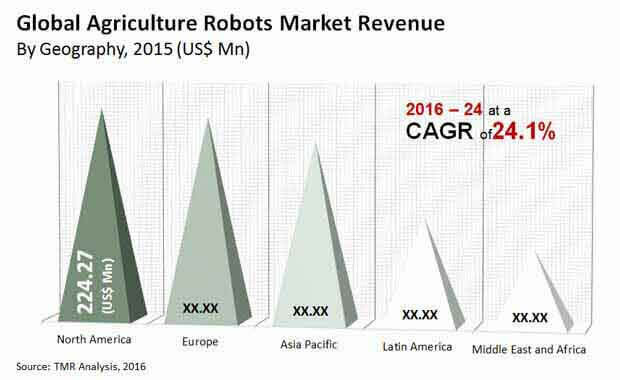 According to a research report released by Transparency Market Research, the global agriculture robots market was worth US$1.01 bn in 2016 and is anticipated to be worth US$5.7 bn by 2024, expanding at a whopping 24.1% CAGR between 2016 and 2024, in terms of revenue. On the basis of type, the market is currently led by driverless tractors, on account of their ability to plough the field automatically and also pick and place articles. Automated harvesting machines are the second most popular type of agriculture robots being used. The growing population, mostly urban, is pushing the demand for increased food production, while steadily decreasing the number of farmers, and is one of the drivers for the agriculture robots market. The number of people shifting to cities and suburbs is growing because of the progress made by urban people and the development of culture. Another important factor boosting the adoption rates of agriculture robots is the reduced arable land across many countries on account of the rapid industrialization and staggering number of new residential and industrial projects. “This is creating a high demand for precision farming, which is being made possible by agriculture robots,” states a TMR analyst. Moreover, the use of robots is also helping in reducing the usage of chemicals. The inability to construct agriculture robots, which are fully capable of carrying out multiple functions in a farm, is one of the limitations faced by players in the industry. The designing of agriculture robots which are programmed for managing crops, livestock rearing, and for irrigation is extremely complicated and complex. Thus, multiple types of robots are to be used for the accomplishment of multiple tasks and this can burn a hole in the pockets of farmers. Thus, the limited scope of robots is acting as a challenge for players in the market. However, the use of telematics sensors in the future is expected to create growth opportunities in the market. Use of telematics sensors help in reducing the complications caused by tractor failures and also in precise use of pesticides to ensure crop health without polluting the environment. The information presented in this review is based on a Transparency Market Research report, titled, “Agriculture Robots Market (Products - UAV, Driverless Tractors, Milking Robots, and Automated Harvesting Machines; Applications - Field Farming, Dairy Management, Indoor Farming, and Horticulture) - Global Industry Analysis, Size, Share, Growth, Trends and Forecast 2016 - 2024"